In a Nutshell: Offering free personalized webpages, about.me is a platform where freelancers, entrepreneurs, and side hustlers can expand their audience and attract new clients. The simple design interface and step-by-step process lets anyone build an online presence to amplify their brand and image. It’s a way for side hustlers and creative types to showcase their talents, accomplishments, and skills, as well as link to their social network and promotional pages. By answering a few quick questions about your abilities, interests, and how you want to present yourself, your personal webpage can be up and active within minutes. In our increasingly transparent and highly connected online world, taking active control of your personal brand is more important than ever. This is especially the case for side hustlers and freelancers, who can leverage personalized online presences to promote themselves to prospective clients. 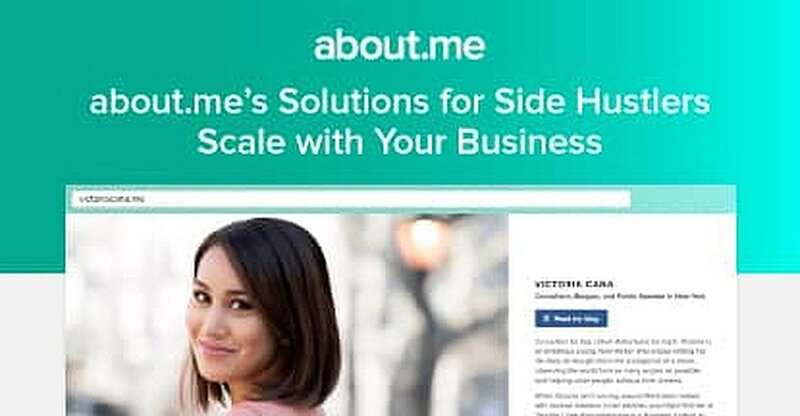 Creating a customized web page through about.me can help to attract more interest in your projects, help to build or grow an audience, and can even help to turn a side hustle into a full-time gig. It’s a way for them to highlight their skills and passions, while inviting potential clients to engage with them more directly. An about.me page gives freelancers, entrepreneurs, and side hustlers a professional way to present their brands and what they have to offer. It also acts as a centralized hub for aggregating all of those social media and promotional websites that may be linked to your personal online identity. The concept for about.me began in 2009, with Tony Conrad and co-founders Ryan Freitas and Tim Young seeking to design an easier way to represent one’s personal identity online. They formed a team and began development of the about.me platform. Four days after going public in December 2010, the company was acquired by AOL. However, when AOL was unable to integrate this new service into its existing offerings, about.me was repurchased by Tony in February of 2013. Since then, the about.me platform has gone through a series of updates to make it even easier to create a personal webpage. We recently spoke with Zoë Björnson, Product Marketing Manager for about.me, and asked her about some of the advantages of establishing your own personal about.me page. With a growing user base of millions of people worldwide, it seems this concept has some pretty broad appeal. One of the best things about creating an about.me page is that it requires no coding skills to build. The interface is simple and easy to navigate. In fact, there’s a button called “Get My Personal Page” located right on the site’s homepage. Click that, and you’re on your way. The interface and easy onboarding steps guide you through the process of filling in your personal details. First, you’ll select a username, which will become the unique name of your about.me page. You’ll also need to include your name and an email address so you can be contacted. No worries, though, your email address is secure and won’t be visible to others. Next, you’ll answer questions regarding your profession, education, personal interests, and things you want people to know about you. During the guided page-building steps, you can choose from a broad list of suggested selections or type in your own unique answers. There’s also a section where you can add links to your social media and promotional pages. Users need no coding knowledge to create effective about.me pages quickly. Another cool thing is the personal bio that’s automatically created for you from the questions you’ve answered and interests you’ve identified. After your personal about.me page is built, you can update and modify it by clicking the Tools icon. There you can edit your bio, update your social links, and even change the appearance of your page layout or photos. When creating your personal about.me page, it’s important to keep a few things in mind. The first is to really spend some time thinking about your audience. Who are they, and what do you want them to know about you? Are you looking to attract clients for your products or services? Or maybe you just want to share your interests. This step will help you design an effective page that will appeal to the people you want to attract. Next, design the content on your page to be interesting to those you want to connect with. Include the types of things that will compel your audience to revisit your page. Next, be authentic. Let your passion shine through in your page design, the images you include, and what you write. Then, there is the call to action or Spotlight button you choose to let people connect with you. There is also a personalized about.me email signature you can create that includes a snapshot of your profile page, and can be included at the end of every email you send. This is an easy way for people to connect with you and your about.me page with a single click. Finally, you’ll find lots of resources for how best to make your about.me page work for you, along with tips and samples, located right on the about.me blog page. The value of having a single personalized web page that can aggregate all of the disparate social media platforms you use really can’t be overstated. When done effectively, this single tool can really take your side hustle to the next level. For example, let’s say you’re an accountant, but your real passion is nature photography. Your about.me page can easily become your portfolio. Or you’re a bartender who has a passion for writing stories. Share samples of your writing on your page, with updates sent out once a week. Other social media and self-promotion websites like Facebook, Twitter, Pinterest, Instagram, and others can be added to your about.me page. In fact, there are more than 50 clickable link icons located in the Social Links section of the tools tab. By incorporating these links into your about.me profile, followers can easily jump to one of your existing pages and place an order or make a purchase. 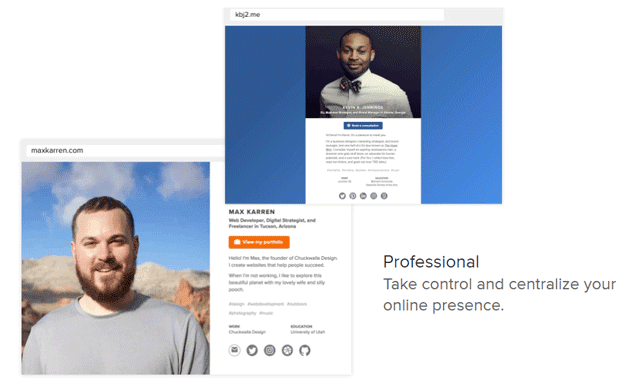 Many side hustlers are using about.me to engage with prospective clients and build an online presence. Side hustler success is often a simple matter of making it easier for people to find you and learn about your passion. about.me lets you do just that. It was designed to take the stress out of centralizing your online presence and to help professionals develop a consistent brand and social media presence. If you’re a side hustler looking to grow your audience or find new clients, use promo code CARDRATES to get 15% off your new personalized domain, like yourname.me.